You may have missed it, but Zoo Atlanta has a four-month-old two-toed sloth that needs a name. Following a popular trend, the zoo is asking you to vote on a name. Unlike other voting contests, which led to the winning name for a boat in Britain being Boaty McBoatface, Zoo Atlanta isn’t giving Atlantans the same amount of freedom. The zoo’s “sloth team” has selected three male names and three female names to choose from. Voting in the contest opened March 5 and closes at 11:45 p.m. March 10. The sloth’s name and gender will be announced March 19 on social media. You can vote for your favorite name here. The infant, mother Bonnie and another adult female, Okra Mae, are currently behind the scenes and cannot be seen by visitors yet. The infant’s father, Cocoa, may be seen in the Zoo’s Brazilian Outpost area. According to a statement from Zoo Atlanta, while sloths are famous for their slow movements, sloth development moves at a notably more rapid pace than the infancies of most other mammals. 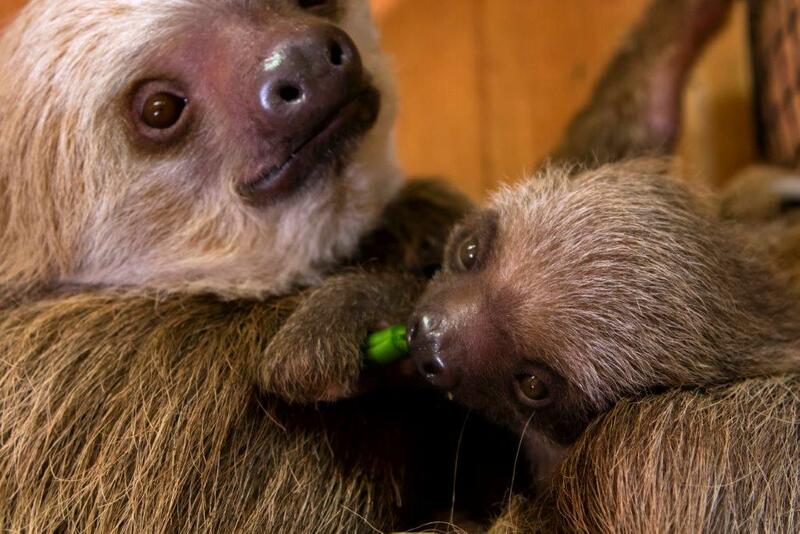 Following a lengthy gestation period of 11 to 12 months, newborn sloths are born fully-furred and with their eyes open and teeth already present, along with fully-developed claws for clinging to their mothers. Infants begin trying solid foods within two weeks of birth. They may continue to remain with or near their mothers for around a year. Native to Central and South America, Hoffmann’s two-toed sloths are not currently classified as endangered, but wild populations face threats as a result of habitat destruction, human encroachment and the pet trade. Lynn Yakubinis, a Lead Keeper at Zoo Atlanta, chairs the Association of Zoos and Aquariums’ Species Survival Plan for Hoffmann’s two-toed sloths and Linne’s two-toed sloths. Zoo Atlanta is an active member of many Species Survival Plan programs, which exist to protect the long-term viability of animal populations housed in accredited North American zoos by working to ensure that zoological populations remain healthy, genetically diverse and self-sustaining for future generations.